Is there a more underappreciated part of your desktop computer system than the keyboard? It’s the second-most-used component—after the display, of course—and yet many people are still using the keyboard that came with their Mac. Every user should choose the keyboard that best fits his or her own preferences and needs, but there are some features and terms you should understand to help you make the proper buying decision. That’s what this guide is for; here are our tips for buying a new keyboard. Design and ergonomics: Keyboard vendors often try to differentiate their products using unique designs or appearances. Some offer different colors, others offer stylish, metal or glossy-plastic finishes. On a practical design level, keyboards also differ in their ergonomics—more-ergonomic designs offer better comfort and safety over long-term use. For example, some manufacturers make thinner keyboards that don't require your wrists to bend unnaturally upward. (Though most keyboards include legs or risers for raising the rear of the keyboard, in most scenarios a downward-sloping keyboard doesn’t enhance ergonomics. Provided your chair and keyboard surface are at the correct heights, a keyboard’s key surface should be approximately parallel to the floor—or even tilted slightly away from you.) Similarly, laptop-style keys generally require less effort to press, reducing fatigue. Other vendors offer true ergonomic designs with curved keyboard layouts; some even split the keyboard and angle the two halves upward to provide more-natural positions for your hands and wrists. Key layout: Given the many decades since the invention of the computer, you’d think that keyboards would have a standard layout. And when it comes to the standard keys you’d find on a typewriter, that’s generally true. Still some keyboard designers have tweaked this layout for reasons of design, cross-platform compatibility, or other considerations, and these changes can affect usability. But even if the standard keys are arranged correctly, each keyboard seems to have a few layout oddities when it comes to other keys. For example, some keyboards consolidate the function keys (F-keys) into a single line instead of using the traditional four-key pods, making it difficult for touch typists to differentiate the keys. (Even worse, oftentimes these F-keys are jammed up against the number—0 through 9—row, making it easy to accidentally hit an F-key when trying to press a number, or vice versa.) Many keyboards have numeric keypads with odd layouts, and more than a few place keys in unconventional locations, further frustrating touch typists. Finally, many current keyboards are designed for both Macs and Windows PCs. This usually means they feature Windows and Alt keys instead of the Mac’s Command and Option buttons, and omit one or more of these modifier keys on one side of the keyboard in favor of a Windows key. You’ll need to use Mac OS X’s Keyboard & Mouse preference pane to configure such a keyboard's modifier keys so they work as expected. The gist of all this is that before choosing a keyboard, you should try it out to make sure its particular layout compromises won't compromise your productivity. If you can't try it out before buying, be sure to buy from a retailer with a good return policy. Connection type: Keyboards connect to your computer either via a USB cable or wirelessly. Wireless keyboards help you avoid cable clutter and, if necessary, let you move farther from your computer. However, since they don’t get power via USB, they require batteries of some sort. Wireless keyboards use either radio-frequency (RF) or Bluetooth technology. RF devices connect to your computer using a small receiver that plugs into a USB port; your Mac immediately recognizes the keyboard. Bluetooth devices require either a computer with built-in Bluetooth or a USB-based Bluetooth dongle. Connecting a Bluetooth input device requires you to pair it with your computer, a process that’s a bit more complicated than simply plugging in a cable or dongle; however, once you've set up such a pairing, the mouse or keyboard should maintain that connection unless you intentionally delete the pairing. Because it’s newer, many people assume Bluetooth is better, but each technology has its advantages. Bluetooth is convenient if your Mac has built-in Bluetooth—as all current Macs do—since you don’t have to keep track of a USB dongle and you don’t sacrifice a USB port. On the other hand, many of today’s USB dongles are so small they barely protrude from your USB port, and RF offers instant plug-and-play use. (Bluetooth input devices can also exhibit reconnection delays after your computer wakes from sleep or after a period of inactivity.) It’s also easier to use an RF mouse or keyboard with multiple computers; you just move the USB dongle. Finally, both technologies are susceptible to interference from nearby wireless signals and electronics; one or the other may perform better in your particular home or office. Portability: Some keyboards are designed for portable use, fitting into the slimmest laptop bags and weighing a pound or less. 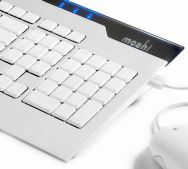 Portable keyboards are also great for use on your lap with a Mac connected to a home-entertainment system. However, to achieve this portability, many portable keyboards lack a numeric keypad, host smaller-than-normal keys, or use non-standard layouts. So "try before you buy" is especially important here. Special features: Manufacturers often add unique features to increase the functionality of a keyboard. The most common such features are special keys for controlling media playback or quickly launching common programs; some keyboards even include dedicated programmable keys that can perform complex macros or other actions. (Note that most keyboards with such keys require you to install special software drivers for full functionality.) Other keyboards include touch pads, iPod docks, and speakers, to name a few other out-of-the ordinary additions. As I mentioned, you really need to try a keyboard before you buy. That said, if you’re looking for some suggestions to help you get started on your shopping, here are three of our favorite current Mac keyboards.